Three years, five months. Three years, five months. Three years, five months. This has been the refrain playing in my mind since July began. Three years and five months ago, my son took his last breaths. He has now been gone as long as he was alive: Three years and five months. I remember talking with another mom just three months after Caemon died. Her daughter had been gone for fifteen years, and she spoke mournfully of the day she was gone longer than she was alive. I remember thinking in that moment that this was a day I would dread. It was something that would loom long in the future. Would I even manage to survive three years and five months without my son? And then longer? Years later, here I am, still living, still breathing, still remembering. And although this day has been looming in my mind’s calendar for years now, I have had trouble with what to make of it. I can hardly grasp that this time that has gone so quickly without him was the same time he spent on this earth. It feels unreal, but then, so does his short life sometimes. The first three years of Caemon’s life were the best of mine. 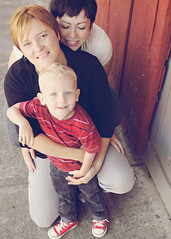 He made me a mom, something I had longed for for years, showing me the expansive love that comes along with that role. And Caemon himself, oh how he lived! In the time leading up to Caemon’s diagnosis, our little family was thriving as a triad. With his illness and then death, it was like the worst of eruptions, leaving nothing but a smoldering crater where my joy, my hope, my family, my son had been. Two years ago, Jodi and I took a trip to Crater Lake–a lake formed in the caldera of a volcano. What was once a mountain is now a crater filled with the most pristine cobalt waters. Trees and wildflowers grow around the rim of this catastrophe-turned-wonder. But Crater Lake, as beautiful as it is, was forever transformed by the eruption that created this hole. It will never be filled with the same material. It will never again be a mountain top. This I am learning to be true of myself. In three years and five months without my son, I have not become the person I was before. Three years and five months have not reset me. I am a mother again, but I am not the mother I was with Caemon. That smoldering crater leukemia left is filling with beautiful things, yes, but never again by my boy. And we may be a lovely family of three, but we will never be the family we were, the family we were meant to be. This week marks three years and five months since Caemon left my arms, three years and five months since I said my final goodbyes, since I drove with my wife back to our home without our healing son in the backseat of the car, three years and five months since the worst day of my life. Such a span is far too long to live without him. That I have to keep going, that he will forever grow increasingly further from my memory’s grasp is a new sort of heartbreak. Three years and five months were all the days that Caemon lived, and in that time, he taught me to be a mom, showed me love like I had never known, fostered in me courage and strength. For three years and five months, he brought me joy bottled up in a blonde-haired cherub and the sort of laughter and wonder and light that no earthly body could possibly contain. Three years and five months was not nearly enough, not for me, but for Caemon, that painfully short lifetime was all he needed–to change me, to change his world. This entry was posted in Caemon's legacy, grief, life after Caemon, milestones, mourning, Uncategorized and tagged bereaved parents, childhood cancer, grief, grieving a child on July 8, 2016 by T.
I will never, ever, ever forget Caemon. Ive never met him. But through your words, I feel as though I have an inkling of how bright the light his being shone out into the world. I will never forget how loved and how wanted he was. Oh Timareee – again, a beautiful tribute to Caemon and his sweet spirit forever with you, with us. Thank you once again for sharing your thoughts with us. A beautiful tribute to a beautiful boy. I can’t believe it’s been that long since he’s been gone, and my heart aches for you and Jodi. What a metaphor. Beautiful. Devastating. Thought you see the crater, though, others see the mountain you are.